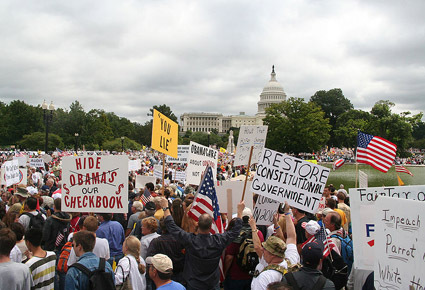 A new survey finds that the Tea Party movement is not just about politics or size of government; it may be about race. Those who believe the government has done too much to support blacks are 36 percent more likely to support the tea party than those who are not. “It’s clear from the data that people who want limited government don’t want certain services for certain kinds of people. Those services include health care,” says Christopher Parker. U. WASHINGTON (US)—A new survey finds that among whites, southerners are 12 percent more likely to support the Tea Party movement than whites in other parts of the United States and that conservatives are 28 percent more likely than liberals to support the effort. “The tea party is not just about politics and size of government. The data suggests it may also be about race,” says Christopher Parker, assistant professor of political science at the University of Washington. The survey found that those who are racially resentful, who believe the U.S. government has done too much to support blacks, are 36 percent more likely to support the Tea Party than those who are not. Indeed, strong support for the tea party movement results in a 45 percent decline in support for health care reform compared with those who oppose the tea party. “While it’s clear that the Tea Party in one sense is about limited government, it’s also clear from the data that people who want limited government don’t want certain services for certain kinds of people. Those services include health care,” Parker says. Parker directed the Multi-State Survey of Race and Politics, a broad look at race relations and politics in contemporary America. The survey reached 1,015 residents of Nevada, Michigan, Missouri, Ohio, North Carolina, Georgia, and California. All were battleground states in the 2008 presidential election with the exception of California, which was included in the survey to represent the West Coast. The survey found that 30 percent of respondents had never heard of the Tea Party, but among those who had, 32 percent strongly approved of it. In that group, 56 percent of Republicans strongly approved, 31 percent of independents strongly approved, and 5 percent of Democrats strongly approved. Among whites who approved, 35 percent said they believe blacks to be hardworking, 45 percent said they believe them intelligent, and 41 percent said they believe them trustworthy. Whites who disapprove of President Barack Obama, the survey found, are 55 percent more likely to support the Tea Party than those who say they approve of him. “Are we in a post-racial society? Our survey indicates a resounding no,” Parker says. Conducted by telephone from Feb. 8 to March 15, the survey reached 494 whites, 380 blacks, 77 Latinos, and 64 members of other races. The sampling error margin is plus or minus 3.1 percentage points. The Washington Institute for the Study of Ethnicity, Race and Sexuality and the UW Department of Political Science paid for the survey. It was conducted by the UW’s Center for Survey Research.